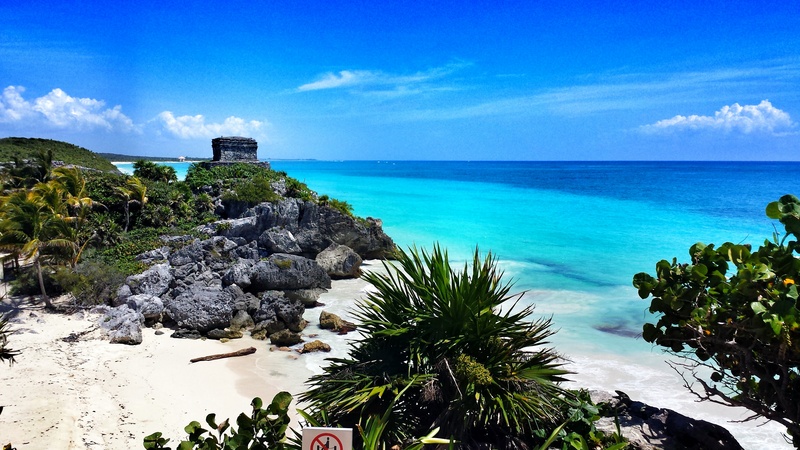 Tulum sits bordered by the Caribbean Sea to the East and The Yucatan Jungle to the west. The diversity of its flora and fauna, numerous cenotes of fresh waters, objects of cult for the ancient Mayas, and an imposing archaeological compound, are the reasons that make of Tul?m a subjugating Eco-Archaeological region filled with history and adventure. it?s best to know, and sometimes only possible to figure it out once in Tulum that there are really three different areas all referred to as Tulum, only minutes away from each other, almost but not close enough though to walk to and from. 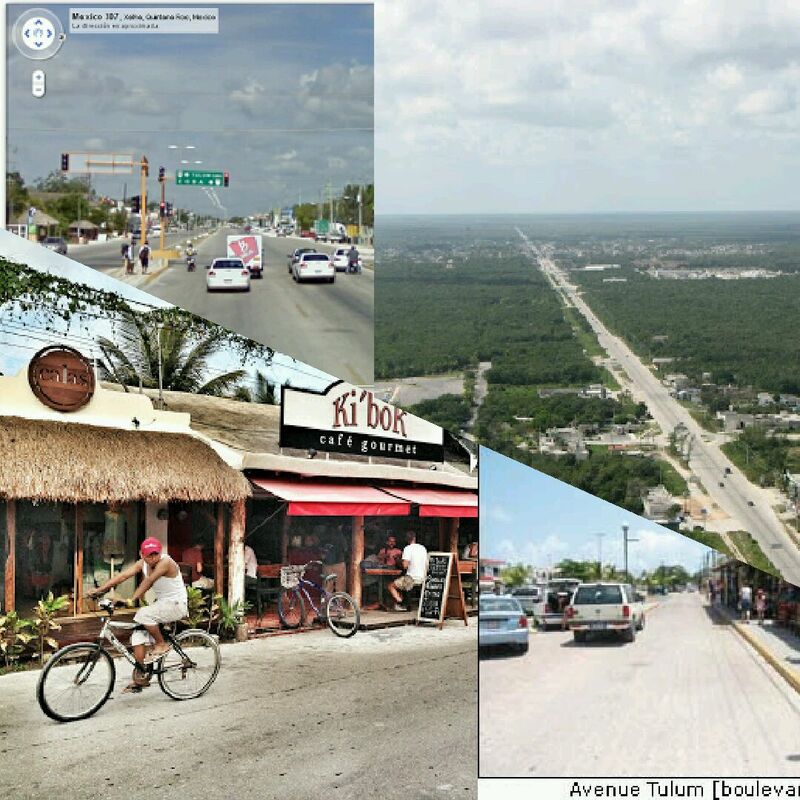 Tulum Pueblo / The Town sits split by highway 307 running South-North. ?El Pueblo?, as referred to by locals, is home to most permanent residents, local, relocated or ex-pats and more and more snowbirds and vacationers spending more than just a few nights in the area. The Pueblo is where many of the stores, supermarkets, Banks, Schools, real estate offices and Realtors, two bus stations, inns, hostels and small hotels are located. This Pueblo section of Tulum has a definite feel of authentic Mexico. Tulum Pueblo is indeed a destination for shopping, eating out at great restaurants, enjoying a modest but growing night life, studying the local Spanish language, booking tours, banking, shopping for food, local vegetables, fruits, cafes, and local flavor, Or learning of Real Estate Options to invest or secure a Vacation Rental. Do not miss Tulum Lueblo, whatever you do. Tulum Playa /Tulum Beach nests along the coastline that leads into the Sian Ka?an Biosphere [Ecological Reserve], the Caribbean white sandy beaches to the east, an impressive mangrove & wetland reserve to the south. Tulum Playa embraces many of the fancier, ecological, boutique and spa hotels, and it has a decent selection of restaurants and night spots. There are also still a few budget beach front cabana-type lodging locations. Walking the beach and simply stepping in to inquire about accommodations and rates is now almost a thing of the past so make reservations as Tulum?s popularity increases with the presence of international and Mexican celebrities. Many of these beach establishments are Eco-friendly and do not provide electricity 24/7. All are off the grid, most generate their own power on Solar wind and generators. If you are staying on the beach you will find that there many restaurant options, many more than in days gone by as Tulum transforms into a preferred Chic destination for the New York Fashion Crowd and it becomes popular with Mexican and Latino Celebrities. These eating options range from a simple fresh fruit stand by the side of the road to world class rated top ten chefs on the planet. Tulum beach road cuisine is setting a trend. Do not miss out. On Tulum Beach thoug there are only a handful of private homes and absolutely no apartments or condominiums. To find a more permanent stay or a stay beyond a short vacation there are many options in the forms of condos, apartments, studios and entire homes for rent in Tulum Pueblo. 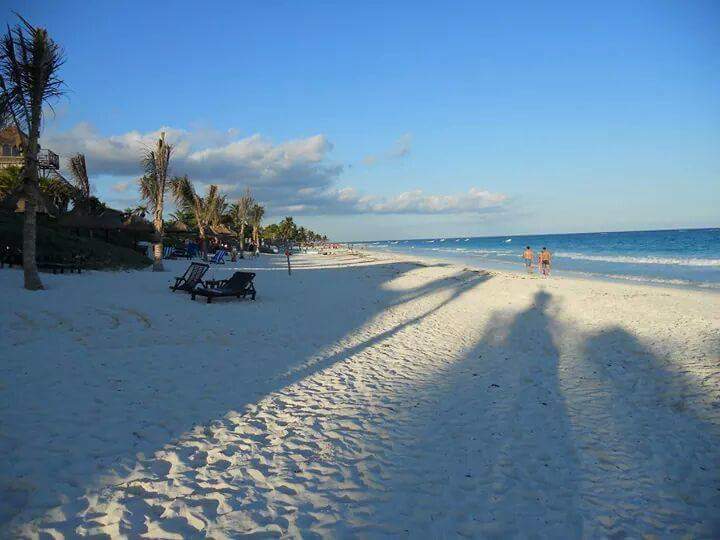 Enjoying Tulum Beach is achieved by most resdients living in Tulum in the form of day trips -short drives to resorts, biking or even a healthy walk down to the powdery beach. Private property that can be owned by non Mexican residents is scarce and very pricey on Tulum Beach. Talk to a professional realtor if you need to know more. Buying property in El Pueblo is less expensive and makes more sense. Taxis have a near monopoly on transport to and from the playa (beach). Buses come from time. Bikes are more and more popular and renting a car is a top option. Beyond the lavish walled City of Tul?m, built by the Mayas on solid cliffs, there are different types of vegetation, with fringes of herbaceous and creeping plants. There are also communities of shrubs and trees with specimens reaching up to 5 metres of height, such as The chit and the chechen palm trees. There are attractive natural settings inhabited by fauna proper of the tropical zones, with birds such as the calandra lark and seabirds such as the pelican. Amongst the mammals we have the anteater, the grey squirrel and the tepezcuintle or agouti, a large rodent, standing out. Every year the sea turtles arrive on its shorelines to lay their eggs. The spectacle is simply impressive, a unique natural experience that allows appreciating the white turtles, the loggerhead sea turtles and the leatherbacks on their struggle to perpetuate their species. They are all on the brink of extinction. 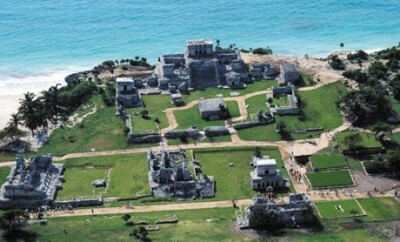 The Tulum archaeological site is a coastal city which was inhabited late after the conquest. It is a walled city with a main lighthouse which casts a beam into the water that guides boats through the reefs. The walls are believed to have been built in the Spanish style. It has been suggested that a Spanish sailor, who was of the first Spaniards captured by the Maya who adopted their ways had some input into the design of the walls as apparent by the ramparts unique to this site. Tulum has many a beautiful beach. At the ruins You can swim out into the ocean and turn to view the ruins, which are quite a site from the water. Further South for 15 Kms there are a fair number of luxury cabins hidden by the jungle vegetation speckeled on 50-yard wide sandy beaches; and even further south, the Sian Ka an Preserve provides visitors with mile upon mile of virgin wilderness on powdery white beaches. Un rinc?n de la selva, zonas arqueol?gicas mayas y cenotes, Tulum es uno de los ?ltimos rincones del caribe donde todav?a se disfruta de una exuberante naturaleza, as? como de anchas playas de arena blanca. Tulum es un espacio ideal para el contacto con la naturaleza, el relajamiento y la exploraci?n, en un ambiente boh?mico y rustico, se respira? el esp?ritu del Caribe Mexicano. Por ello se dice que? Tulum y Ecologia son llevados a la par en este destino tur?stico. La zona arqueol?gica de Tulum se dio a conoce al mundo en el libro de viajes de John Stephens y Frederick Catherwood, publicado? en 1843. Es la mejor expresi?n de la arquitectura maya de toda la costa e la pen?nsula de Yucat?n, y es representativa del poscl?sico, por datar entre 900 y 1524 D.C.
* El castillo con 12 metros de altura es la edificaci?n m?s alta del sitio. * El templo del viento, es el ?nico edificio que planta circular en la zona arqueol?gica que remite al dios del viento (Ehecati-Quetzalcoatl) ya que por la ausencia de esquinas favorece su libre circulaci?n. Nombre que en maya significa ?Donde nace el cielo? fue declarada desde hace 22 a?os Patrimonio Hist?rico del la Humanidad por la Organizaci?n de las Naciones Unidas? para la Educaci?n, la Ciencia y Cultura (UNESCO). Visitar esta reserva es adentrarse en uno de los mas cuidados secretos de los mayas; exuberante vegetaci?n end?mica, con playas v?rgenes? y poco exploradas de color azul turquesa para luego dar con la ?laguna de Kaapechen?, de color verde esmeralda que cambia de tonalidad a cada momento? en cuyo centro hay un cenote de agua dulce que la alimenta. Es importante visitar el cenote ?Cristal? y el cenote ?Escondido?, a unos cincos kil?metros al sur de Tulum, rumbo a Chetumal. El Gran Cenote o en ?Cenote Calavera?,? que estan a unos 3.5 kil?metros del crucero del pueblo en direcci?n a Coba. Descubre ?Xcacel? que es la zona de mayor anidaci?n de tortuga marina Caguama (Carretta Carretta) y Blanca (Chelonia mydas mydas) de la regi?n. Entre las zonas arqueol?gicas mayas mas importantes y bellas esta coba a 42 kil?metros de Tulum, en donde se encuentra una pir?mide de mayor altura de la pen?nsula de Yucat?n. La zona Arqueol?gica de Muyil como a 15 kil?metros hacia el sur de Tulum, cuenta con tres edificios restaurados y un sendero representativo de 500 metros que va atrav?s de la selva llegando hasta la laguna de Muyil, que se presume es donde comienza la ruta del comercio maya.